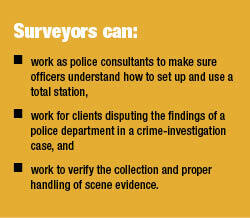 Surveyors can support the field of forensics investigation in several ways. If you’ve wondered how you might parlay your surveying skills into other market niches, forensic mapping might be a logical avenue to consider. Why? Crime scene investigators and reconstructionists predominantly use the same ubiquitous mapping tool as surveyors: the total station. Surveyors can become a valuable resource for police departments, possibly even at crime scenes, given their thorough knowledge of mapping principles. Surveyors, after all, are uniquely trained to meticulously gather information on project sites every day. Therefore, this skill can help them apply and broaden their knowledge at forensic mapping scenes. Hayden Baldwin, executive director of the International Crime Scene Investigators Association, sees technology such as the total station as both a difficult challenge and a major benefit to law enforcement agencies. Of the more than 18,000 police agencies throughout the United States, about 10% may be large enough to have total stations, Baldwin estimates. Therefore, the remaining 90% of police departments serving populations of below 25,000 “probably are not going to have a total station,” Baldwin said. “So, they won’t have access to technology.” In such instances, these agencies request support for crime- or crash-scene investigations from their county or state police. Meanwhile, agencies lucky enough to own a total station tend to share it among crime- and crash-scene investigators, which helps to justify the total station’s cost over time. With budget cutbacks mounting for many cities, particularly in their police departments, any existing gap in knowledge about how to use a total station or other technologies for forensic mapping may widen. For this reason, one of the ways that surveyors are dabbling in forensic mapping is by training law enforcement officers on how to use a total station. Mapping expert Tony Kavan, an investigator with the Criminal Investigative Services Division of the Nebraska State Patrol, represents a good resource for surveyors to approach. Kavan teaches classes on forensic mapping. As part of his classes, the basics of how to set up and operate a total station would be familiar to surveyors. However, forensic mapping itself is far different than surveying a piece of land. What is forensic mapping? It involves recording coordinate data and creating a scale diagram for a crash scene or a crime scene. Another definition is offered by Chuck Veppert, a retired reconstructionist with the Ohio State Patrol and a member of the Professional Society of Forensic Mapping. Says Veppert, “I think police officers and reconstructionists define forensic mapping as a combination of two sciences. These two sciences are forensic scene investigation and the art of drawing specific locations of crime scenes.” An integral part of this process is the forensic investigator’s ability to understand and identify crime- or crash-scene evidence, how best to document it, and then how to present his or her findings in court. Of course, other mapping methods are available to investigators, such as photogrammetry, laser scanners, and laser mapping systems. All of these are effective scene-mapping tools. And chances are good that many police departments use these, maybe even in addition to total stations. But the total station remains the most common mapping tool to be found in use at crash and crime scenes. If you’re planning to pursue forensic mapping as a new market niche for your surveying business, tips from trained experts will give a good idea of the methodology involved. It is likely you will handle many more crash scenes than crime scenes. But remember, crash scenes can immediately become crime scenes should a crash result in driver and/or passenger fatalities. Also, crash scenes differ tremendously from most surveying applications because they produce critical evidence that eventually could be presented in court. The identification of key evidence versus unrelated evidence is essential. Added to all of this is the pressure to re-open partially closed roads to ensure safety among anxious drivers and police officers working at the scene. The Sherman, Texas, Police Department has become well seasoned in investigating crash scenes, especially those involving fatalities. For example, Mark Wood, an officer with his department’s Critical Accident Investigation Team, was called to an incident where a bus arriving in Sherman crossed a narrow, short bridge, then suddenly veered off of it, plunging into a creek below. The bus was filled with 55 passengers, 12 who died upon impact and five in the days following the investigation. Officer Wood knew just how he would tackle documenting this complex scene, and his approach serves as a good foren-sic-investigation training example. Aiding him was a Sokkia SET53OR reflectorless total station, along with MapScenes Evidence Recorder and Forensic CAD software by Microsurvey. The total station enabled Wood to map the bus in its final position in 3D on all sides. He then mapped the entire scene in 3D including the bridge and creek. The evidence-collection software was a vital tool as well for documenting the bus crash scene. “I knew I could use the software to rotate my [3D] drawing while mapping to indicate that I was following the line properly, and that I was getting all the dimensions of the bus to ensure it was in correlation to what I was actually seeing,” Wood explained. Although this case did not end up in court, Officer Wood gave a seven-hour deposition on it. He showed several views of the bus he had created using the MapScenes Forensic CAD software. In particular, the software can create a 3D surface model, which allows the user to accurately depict the general orientation of a crash or crime scene based on 3D measurement data. Once this was completed, the 3D diagram could be rotated to show various angles and views that a presenter and his audience may wish to see. The ability of the diagramming software to place links to photo files for the bus diagram and to insert photographs as background was also valuable, Wood noted. 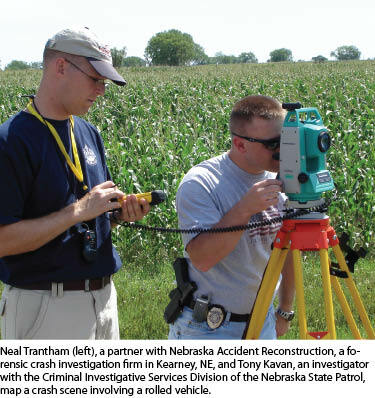 According to Neil Trantham, a partner with Nebraska Accident Reconstruction, a forensic crash investigation firm in Kearney, Nebraska, crash-investigation technique is critical. Yet, again, this must be balanced with safety for officers and drivers. 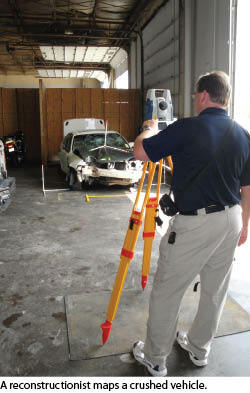 “The quicker you can secure that scene, the safer it is for motorists and officers,” Trantham said.Trantham uses three types of total stations for crash scene investigations. One is the Sokkia 600 series that accomplishes distance measurements through the miniaturized EDM in less than three seconds and can measure more than a mile to a single prism. Also used are several Sokkia reflectorless total station models, along with two Sokkia robotic total stations. As surveyors eye forensic mapping as a new business path, they will quickly learn that it combines many elements—evidence, supremely accurate scene-evidence measuring at a faster pace than regular surveying, equipment tailored for forensic mapping (such as total stations), and generation of scale diagrams for possible courtroom presentation. Trantham notes three techniques that forensic investigators and reconstructionists can apply with total stations to accelerate scene mapping. The first is making sure the operator is comfortable with running his or her total station. Knowing the total station and having it set up properly will allow better mapping. “As the person running the prism pole is walking between points, the total station operator, if he’s good, should be able to be following and ready—as soon as that person stops—to capture that point within a few seconds, then re-aim and find the prism operator,” Trantham explained. The second technique pertains to scenes where there is heavy rush-hour traffic and the roadway must be reopened. “The road is not going anywhere, but the evidence possibly will,” Trantham said. “What we’ll do is map the evidence and put down a couple of fixed points (i.e., concrete nails) once we have the roadway mapped. We’ll come back, maybe in the middle of night, and capture points at the roadway and map it later,” Trantham added. Curtis Sumner, executive director of ACSM, sees various points at which surveyors can enter the forensic-scene-mapping field. For example, surveyors can develop relationships with their local government, such as public works departments. “That kind of relationship might transfer well into the police department since you’re already under contract,” Sumner said. “So, the public works department might refer you to the police department.” In this instance, the surveyor could be a consultant who, at the very least, can make sure officers understand how to set up and use a total station. Another opportunity Sumner sees for surveyors is what he calls the “the other side of the equation.” That is, surveyors could be hired by clients looking to dispute the findings of a police department in a crime investigation case. “This would be done on the basis that the police officer knew how to use the equipment [a total station], but that he didn’t necessarily understand what it was doing, or that he did not use the equipment in a way that the professional surveyor would,” Sumner said. BOB GALVIN is a Portland, Oregon-based freelance writer who writes on technology trends. His writing covers developments in total station equipment and diagramming and data collection software.